Tammy365: How to turn Gossip into Good! How to turn Gossip into Good! Do you remember the last time someone wanted to hear your juicy conversation and anxiously yelled "Tell me, tell me!"? Did you tell them? If you did, you are not alone. A Social Issues Research Center reported that gossip accounts for 55% of male conversations and 67% of women's conversations, a much smaller gap between the two sexes than originally thought. The truth is not gossip, right? That is correct. Gossip is malicious talk of unconfirmed or false origin. Proverbs 15:1-3 reads "A soft answer turneth away wrath: but grievous words stir up anger. The tongue of the wise useth knowledge aright: but the mouth of fools poureth out foolishness. The eyes of the Lord are in every place, beholding the evil and the good." What about spreading good news that is true? Mark 16:15 instructs us to "Go ye into all the world, and preach the gospel to every creature." One line my pastor said this past Sunday stuck in my head. He said "We should pass on the good news!" Immediately, the ugly face of gossip jumped into my mind. God quickly replaced my thought with his revelation. 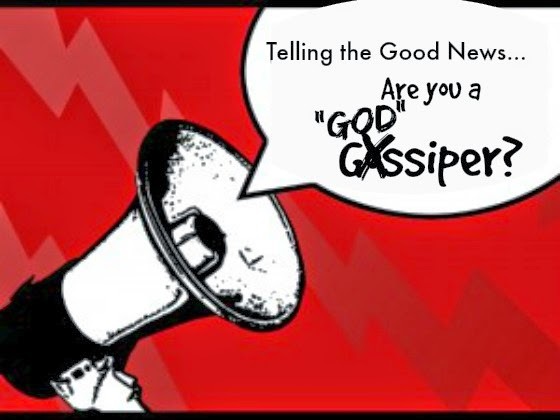 Telling the good news about the truth of Jesus Christ makes one a "GOD"-siper, not a gossiper! Psssttt, pass it on! Feel free to leave me a comment with your thoughts.